Brenda has always had a strong connection to Augsburg with four family members and a husband who claim Augsburg as their alma mater. After receiving her Physician Assistant certificate in 1999 from Augsburg, she received a master’s in physician assistant studies from the University of Nebraska and worked as a PA for four years before returning to Augsburg to teach full time. Here, Brenda has developed a program that introduces diverse high school students to the physician assistant profession and provides hands-on learning experiences about health and wellness. Jim Haglund has been involved with Augsburg College as a member of the Board of Regents, as a donor and long-time supporter of the College and its students, including his own daughter, Dawn, who is a 1997 graduate of Augsburg. He is the president and owner of Minneapolis-based Central Container Corporation and is co-owner of Spectrum Screen Printing. He is a graduate of the University of Minnesota and St. Thomas. 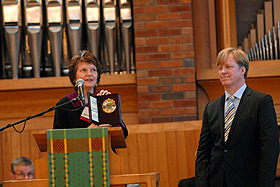 The Augsburg College Board of Regents and the Augsburg Alumni Association bestow the Distinguished Alumni Award in recognition of significant achievement in vocation, for outstanding contribution to church and community, and for a life that exemplifies the ideals and mission of Augsburg College. Despite living and working in Norway, Tove Dahl and Curt Rice have remained closely connected to and involved in the life of Augsburg College since their graduation. In addition to serving as an associate professor of psychology at the University of TromsÃ¸, and as the dean of Skogfjorden, the Norwegian village of Concordia’s International Villages, Tove also sits on the board of Norway’s Centre for Peace Studies. Curt chaired the English department at the University of Tromsø before becoming the Director of the Center for Advanced Study in Theoretical Linguistics (CASTL), which was the first Center of Excellence at the University. Curt is also the co-editor of Linguistic Inquiry and serves on the editorial boards of several linguistics journals. In January 2009 Curt became the Pro-Rector for Research and Development at the University of Tromsø. A founding member of The Loft Literary Center, Phebe Hanson is a highly respected figure who has used her gifts as a poet and journal keeper, teacher, mentor, and innovator and generator of excellence in Minnesota’s arts community. After graduating from Augsburg in 1950, Phebe taught high school English for two years in rural Minnesota. She married John Hanson ’48 in 1953 and spent the next 12 years raising their three children and a series of foster children, teaching Sunday school, and participating in civil rights and peace organizations. A teacher, coach, athlete, mentor, advocate, and friend to many, Joyce Pfaff has been a driving force for women’ s athletics at Augsburg her entire career. After graduating from Augsburg in 1965 with an education degree, Joyce accepted a teaching position which led to a 43-year career with the College. She was a pioneer in developing opportunities for women to participate in intercollegiate athletics, starting the first volleyball, gymnastics, tennis, softball, and track and field teams for women and re-establishing the women’s basketball team at Augsburg.